Yes…a new year. A new determination to make this MY year and get my diet where I want it to be. Not where others prefer, maybe not even in their comfort zones, but to take the knowledge I gained in college courses on fitness and nutrition, what I have learned from life and from reading, and from what my body says makes me feel best and make some changes. First up. The dreaded…cover your eyes…no don’t, then you can’t read this, lol…Monthly Menu! Meal Plan! Whatever you choose to call it, it is a great idea that makes me crazy. One…. it doesn’t really allow for shopping on a budget. In my case, I shop around sales and coupons and what is in season. Not easy to plan for those. Two…. I don’t know ahead what I ‘feel’ like cooking, how much time we’ll have after events, traffic, life…or what the boys will want to eat on any given night. Three…. my very ADHD brain just doesn’t WANNA. Okay, that’s not a very good reason, and the OCD part of me is grinning and rubbing her hands together in anticipation of my actually creating a plan for any part of my life. In everyday America meal plans are planned around the meat. Not mine. There…that wasn’t so bad. And I had a lot of the ingredients on hand or they are staples. Gonna make this work. I am a ‘working-on-it’ healthy eating fanatic. I backslide; I admit it. Never all the way; just small ‘errors’ in judgement, ha. I am not as strong-willed as my eldest daughter who has been straight vegan for…ever! And it shows. She is healthy strong, and fearless. I hope a little of that comes from me…making her endure packed lunches with homemade whole grain bread (no white bread in this household! ), and fruits, veggies…no bologna or processed foods…just things I knew were healthy for a growing little person but awfully hard to explain to classmates who just thought she/we were ‘weird’. The entire family has been red meat free for 15 years for humane and environmental reasons. I have in the last couple of years started cutting out all the turkey and chicken…and while I am pretty successful in managing mine, it is still in the house because I also have a very recalcitrant teenage son who wants his ‘meat’ at least sometimes. Since this way of eating is my personal choice…and I hope someday he will make that choice on his own…I am not going to force it on him. But here we are with a new month, a new year…and I am eager to expand my horizons on the foodie front. Combine filling. Add the creamed avocado. Gently stuff filling into each okra boat. A crazy busy week that began on Saturday before my birthday and culminated today in a marathon of cooking and experimenting. It was great! Reesie invited her ‘sweety’ over to have Thanksgiving with the family. He got to meet AJ and the pets… he survived the shock, ha ha. One of the goals I set myself for this new year is to not just eat healthier, but to explore new possibilities. What better time to indulge than today? 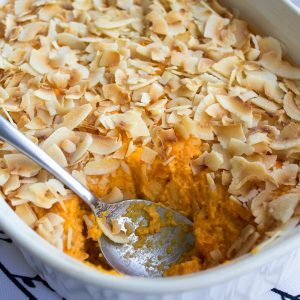 First up, a departure from the sugar-laden sweet potato casserole with its marshmallow topping invitation to diabetes… instead I made sweet potatoes with coconut sauce and fresh coconut which provided natural sweetness and a surprising crunchy contrast to the creamier sweet potatoes. 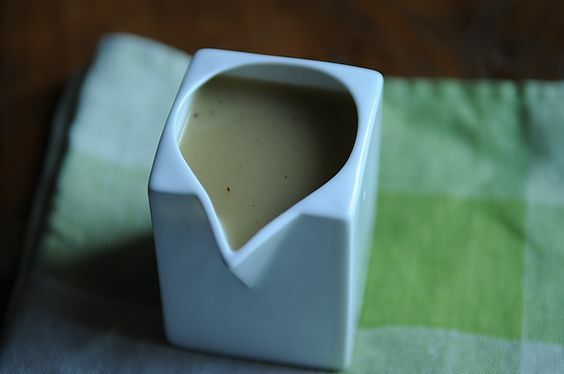 Instead of traditional gravy I made a lovely gravy with vegetable broth, sage, and apple cider. It turned out great, even the kids loved it. 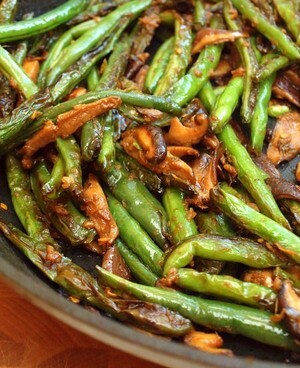 And green bean casserole with its mushroom soup and fried onion topping was replaced with wonderful fresh green beans sauteed with a touch of garlic, caramelized onion, mushrooms (in this case brown beech mushrooms for their lovely nutty flavor, shiitake, and oyster mushrooms for their ‘meaty’ texture), fresh ginger, and a splash of my favorite spicy szechuan sauce and sesame oil. I took some new ideas, tweaked them to fit our tastes, and what was available, and had so much fun in the kitchen this year. Truly another reason to be so thankful this year. Can’t wait for the next special occasion to see what I can come up with next. Hope your Thanksgiving was extra special too. Now I admit, the first time I tried mochi I was …well, underwhelmed. My girls assured me we just got a ‘bad’ example. A couple of months later we tried it again, different brand, different flavor, and ooohhh! Yumm! Tonight I was introduced to the next stage of mochi madness….mochi ice cream balls!! ooooohhh!!! The bliss…sweet, creamy, cold middles (you can also use sorbet if you want to go dairy free…still mmmm!) and the nummy sweet deliciousness of a mochi coating. Got to try this at home! Mango is so amazing. Green tea is my favorite. All the flavors are luscious. So, here is the recipe I am going to try asap.